IMPORTANT: THIS EVENT IS NOW FULLY BOOKED. IBBC WILL NOT BE ACCEPTING ANY MORE REGISTRATIONS. IBBC is the premier organisation promoting UK small and medium sized enterprises to trade with Iraq and this now annual event is the leading business event where such companies can showcase their products and services to over one hundred visiting Iraq business people. The event will be open for all business sectors but currently the priority sectors in Iraq are Oil & Gas, Electricity and Water, Construction & Infrastructure, Tech, Financial & Professional Services. In addition, there is increasing interest and opportunities in healthcare, food processing, automotive and foodstuffs. The agenda for the day will comprise of a key note speech, two panels of Iraqi and British business people identifying opportunities and capability to supply, followed by one to one meetings between companies hosting displays and our Iraqi visitors. Tickets are complimentary and on a first come first serve basis, coffee and a sandwich lunch will be provided. london@webuildiraq.org or phone +44 (0) 20 7222 7100. 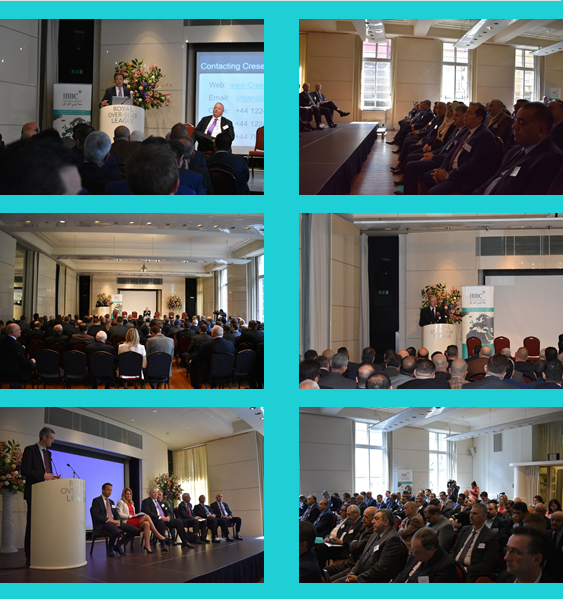 Join IBBC, its members and the international business and finance community for a full agenda of expert speakers, UK & Iraqi politicians and many networking and business development opportunities. 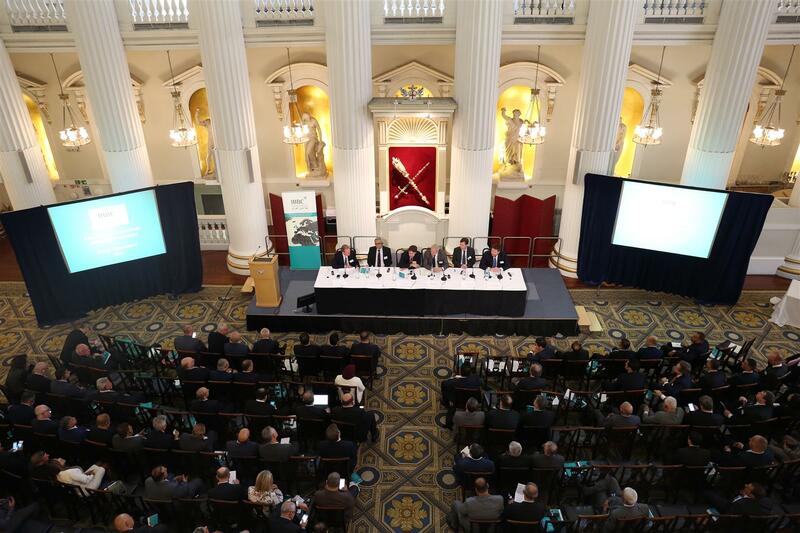 With a strong focus on the banking & financial sector in Iraq this year, we expect the most prominent institutions from Iraq, the UK and international financial organisations involved in Iraq to attend. Other sessions will focus on Oil & Gas, human capital and capacity building in the public sector. H.E. Dr Fuad Hussein, Deputy Prime Minister and Minister of Finance will lead a high level delegation alongside Dr Mehdi Al Alak, Secretary General of the Council of Ministers, officials from the Central Bank of Iraq, a delegation from the Union of Private Banks and the Governors of Erbil, Sulamania and Karbala. Round-table discussions will take place with Iraqi officials where delegates can engage in concentrated debates on country specific issues. Dr Mehdi Al Alak, Secretary General of the Council of Ministers will present a paper on ‘Private Sector Development and Investment in Iraq‘. Delegates will receive an exclusive insight into the Government’s planned measures and strategies to realise this ambition. Baroness Nicholson of Winterbourne, President of IBBC and the Prime Minister’s Trade Envoy to Iraq, Azerbaijan, Turkmenistan & Kazakhstan will open the conference, alongside The Lord Mayor Locum Tenens, H.E. Dr Fuad Hussein, Deputy Prime Minister, Minister of Finance, The Rt. Hon. Alistair Burt MP, Graham Stuart MP, Minister for Investment, Department for International Trade and Jon Wilks CMG, Her Majesty’s Ambassador to Iraq. For more information, including sponsorship opportunities, email london@webuildiraq.org or telephone 020 7222 7100. Registration is now open. IBBC members and members of partner organisations are entitled to special discounted rates. To request the discount codes or if you need assistance, please email the team at london@webuildiraq.org or phone +44 (0) 20 7222 7100. 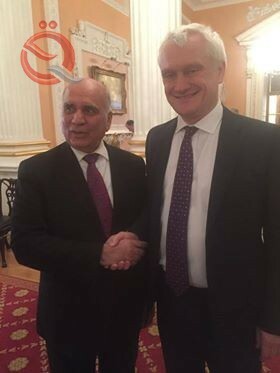 Deputy Prime Minister for Economic Affairs and Finance Minister Fouad Hussein met in London on the sidelines of the 10th anniversary of the establishment of the Iraqi-British Business Council by Mr. Mark Field, Minister of State for Foreign Affairs. And drag Z during the meeting , they discussed joint bilateral relations between Iraq and the United Kingdom and ways of developing them for the benefit of municipal friendly . Also during the meeting , they exchanged views on developments in the political in the region and the recent tensions and the need to prevail stability and a network of international relations in the Middle East are built to be On good-neighborly relations and common interests.He also discussed the Iraqi government program, especially in terms of economic reforms and the law of the state budget. Mr. Field pointed out his country's readiness to provide all support for the success of the Iraqi government's task in construction and reconstruction, providing services and developing the private sector. 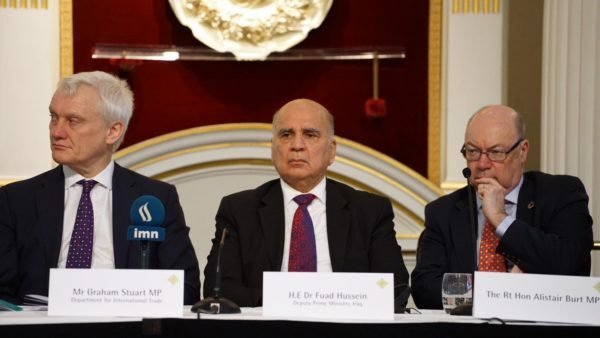 M n For his part , Mr. Fuad Hussein thanked the British government for its continued support for the people of the Iraqi government , especially in regard to the development of the work of the financial and economic institutions. Finance Minister Fouad Hussein said on Wednesday that the government had begun early in preparing for the general budget law for 2020. "The Deputy Prime Minister for Economic Affairs and Minister of Finance Fuad Hussein in London, British Minister of International Trade Graham Stewart, the two sides reviewed the economic and trade relations between Iraq and Britain and discussed the best ways to enhance trade exchange," the Information Office of the Minister of Finance said in a statement. And develop the role of the private sector in this context. " The Office added that "the Deputy Prime Minister gave a brief explanation of the State Budget Law for 2019 and the government plans to promote economic activity through the government program," noting that "the government began early in the preparation of the law of the General Budget for the year 2020 through the meeting directly each Representatives of ministries, bodies and governorates to find out their actual needs. " Fuad Hussein said that he held several meetings with Iraqi and international institutions to develop the working environment, investment and trade and discuss issues of entry, reform of the tax and customs system and the development of banking and other work to facilitate the work of companies and the private sector of Iraq and foreign. "Britain is an important partner for Iraq and we are interested in increasing the balance of trade between the two countries," he said. For his part, Stewart stressed the "readiness of his country to cooperate fully with the Iraqi government to develop the working environment and exchange of experiences and increase the volume of trade exchange and urged British companies to benefit from the investment offer in Iraq." 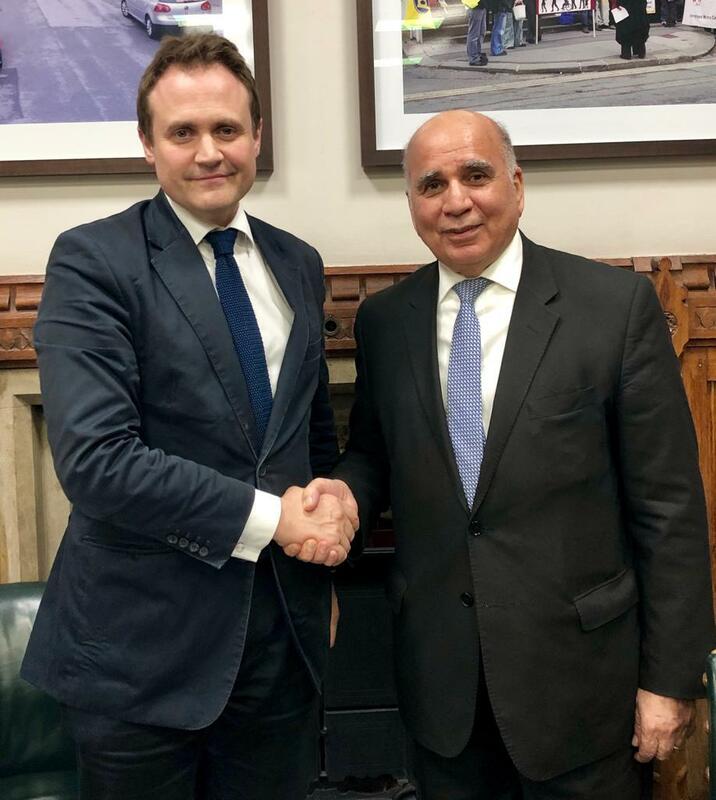 Deputy Prime Minister for Economic Affairs and Minister of Finance Mr. Fouad Hussein met in London, London, 10 April 2019 Mr. Louis Taylor, CEO of the British Export Finance Corporation. Mr. Hussein thanked the Iraqi government and people for the support provided to Iraq in the financing of strategic projects, especially in relation to the infrastructure of water and electricity projects. The Deputy Prime Minister for Economic Affairs reviewed the priorities of the future Iraqi government, which came within the government program which depends on the provision of services and reconstruction and the adoption of long-term strategic projects. For his part, Taylor said that the Foundation looks forward to future work with the Iraqi financial institutions and supporting projects that contribute to diversifying Iraqi sources of income, supporting the private economy and making it a key player in the economy and contributing to the efforts of the Iraqi government for reconstruction and normalization in the affected areas. 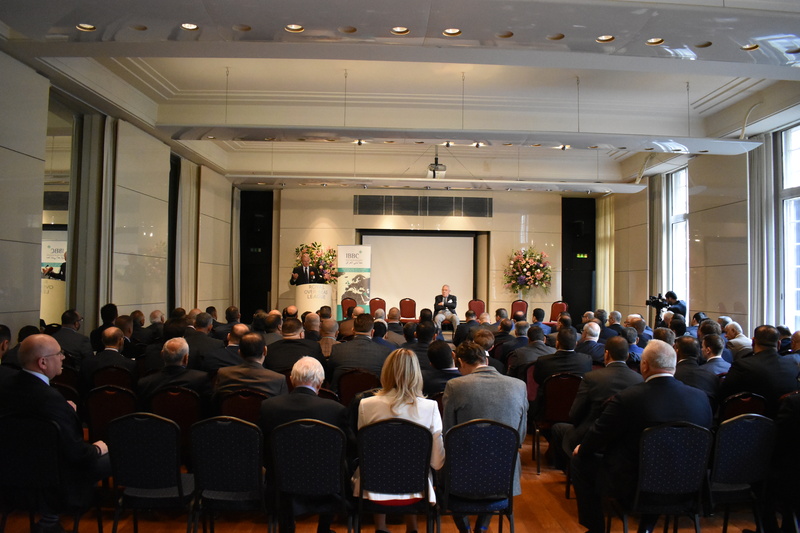 Deputy Prime Minister for Economic Affairs and Finance Minister Mr. Fouad Hussein participated in the British capital London , the anniversary of the founding of the British Iraqi Business Council. I am pleased to be with you to celebrate the tenth anniversary of the establishment of the Iraqi-British Business Council. I learned from the Baroness (Emma Nicholson) that ten years ago the Council was composed of foreign companies. Today, Iraqi companies represent 50% of the composition of the Council. This is a sign that the Iraqi private sector is growing and entering into partnerships with its cross-border counterparts. It is fair to say that the Iraqi-British Business Council had a role in achieving this. - Passing the budget of 2019 in the month of January last, and this was the fastest budget passed since 2003. - Implementation of the decision to remove internal customs points and the adoption of customs duties uniform at all border crossings. - Progress in resolving the outstanding problems between Baghdad and Erbil and still work in this direction. - Implementation of decentralization policy as the provinces now have broader powers in the management of its affairs. - To regulate and increase non-oil imports such as taxes, customs imports, internal debt benefits and other amounts derived from the provision of services such as electricity and water. - serious steps in the completion of projects that provide better services to the population in the water and electricity sectors. In terms of security, there is a marked improvement on the level of Iraq as a whole, that most of Iraq's major cities now have a much better security situation than in previous years. After a collapse and a daunting defeat, the government directed resources and major efforts to improve the security situation and remove pockets and terror cells scattered here and there, the results are the best witness to this. Today Iraqi families in Baghdad and all over Iraq live a normal life, as markets and shops remain open until early morning, and traveling between Iraq's major cities has become safer and easier. I find it necessary to give you some facts about the budget of 2019 in this budget was adopted the price of oil $ 56 per barrel, and predicted the export of 3.88 million barrels per day. Aladdadi to point out that the stability of prices and demand on the world markets is a key factor to determine the actual count of Iraq , Because nearly 90% of the total budget of 2019 imports oil imports. Therefore, we in the government encourage investment in sectors that could increase non-oil imports, such as agriculture and related industries, tourism and transport. Which in addition create jobs that help transform the workforce from the public sector to the private sector and thus reduce the financial burden on the operational part of our annual budgets. - "Institutional" challenges such as low institutional efficiency, a large and broad public sector system, and financial and administrative corruption. - "Economic" obstacles such as deteriorating business and investment climate, imbalance in trade exchange, increase in public loans, the underdeveloped banking system, and the limited role of the private sector in economic life, in addition to "social" and "environmental" constraints. For anti-corruption efforts, Prime Minister Adel Abdul-Mahdi had indicated at the first meeting of the newly formed Supreme Council for Combating Corruption that the risk of corruption was no less than a stark danger. Ladies and gentlemen, and in the same way we have won the support of our friends in the world, we intend to win over Corruption and again with the help of our friends in the world. The newly formed Supreme Council for Combating Corruption with other anti-corruption institutions and the judicial institution, backed by the government will be harsh on corruption and spoilers. We have also started internal discussions with international development organizations working in Iraq and specialized companies from the private sector to review the long administrative work contexts in order to develop them from "paper" to "electronic governance." We realize that this takes time and that the process of change will be difficult and painful but for the choice Let us just accept the challenge and start the process of change. As for the banking sector, the government and the Central Bank of Iraq have started to work with international banks and financial institutions and the world's prudent to develop our banks and the banking system, especially private sector banks. As an Iraqi government, we encourage international banks and financial institutions to work with the Iraqi banking sector so that these banks take their natural role as a key player in the economic life of the country. According to available statistics, there are still 1.9 million displaced people in Iraq, and the largest percentage comes from Nineveh province with about 600,000 displaced people. Since the end of major military operations less than two years ago, with the valuable assistance of the international community, 4 million people have been able to return to their original places of residence. The hard work continues to normalize the situation of these returnees and help them to settle and live in the places they returned to. That Iraq is a promising country and has many business and investment opportunities and here I invite international companies including the British to come to Iraq and work with the public and private sectors. You will certainly face difficulties, but we promise that we are always ready to help. In conclusion, I would like to reiterate that with the end of military operations against terrorism, we are determined to enter the battle of business, reconstruction and development. 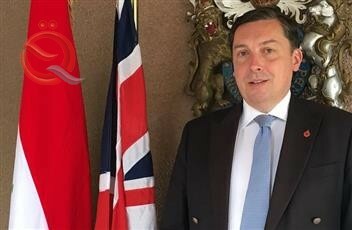 "I have been named the 2019 year of business in Iraq, I am sure that companies from the UK will do much and according to the priorities set by the Iraqi government," said John Wilkes, the ambassador of the United Kingdom. "... I agree with you, Mr. Ambassador, and our efforts will continue to make the work environment and investment convenient and easy for all. Deputy Prime Minister for Economic Affairs and Minister of Finance Mr. Fouad Hussein met in London, British Minister of International Trade, Mr. Graham Stewart. The two sides reviewed the economic and trade relations between Iraq and Britain and discussed the best ways to enhance trade exchange and develop the role of the private sector in this context. The Deputy Prime Minister briefed briefly on the State Budget Law of 2019 and the government's plans to promote economic activity through the government program. He also pointed out that the government started early in preparing the general budget law for the year 2020 through direct meeting with all representatives of ministries, To find out their actual needs. He also pointed out that he held several meetings with the Iraqi and international institutions to develop the working environment, investment and trade, and discuss issues of entry features, reform of the tax and customs system and the development of banking and other work to facilitate the work of companies and the private sector in Iraq and abroad. In addition, Britain is an important partner for Iraq and we are interested in increasing the balance of trade between the two countries. For his part, Mr. Stewart stressed his country's readiness to cooperate with the Iraqi government to develop the working environment and exchange experiences and increase the volume of trade exchange and urged British companies to benefit from the investment offer in Iraq. The Deputy Prime Minister for Economic Affairs met with Finance Minister Fouad Hussein in the British capital of London, the chairman of the British House Relations Committee, Tom Tojndhat. During the meeting, the two sides reviewed the distinguished relations between Iraq and Britain and the need to strengthen efforts to combat radical and extremist ideology and the latest developments on the political and economic fronts. The Iraqi government adopted an ambitious government program that prioritized the provision of services, reconstruction and repair of cities destroyed by military operations after the expulsion of the so-called Islamic State Organization. In a related context, Mr. Fouad Hussein pointed out that the wisdom also adopted solutions to internal problems and that the relationship now between Baghdad and Erbil in a continuous development and stability of that relationship is an important corner in the stability of Iraq and the region and will benefit all the people of the country. He added that Iraq is working hard to be a catalyst for the stability of the region and to have balanced relations with all neighboring countries and the international community based on mutual interests and mutual respect. 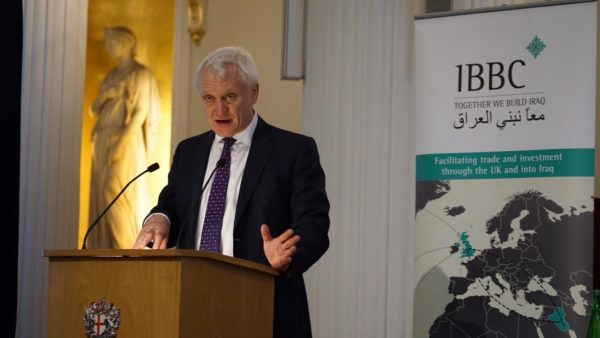 For his part, Tom Tojndhat expressed his country's readiness to contribute to the reconstruction and reconstruction campaigns as well as fight extremism and extremism and strengthen relations and trade exchange between Iraq and Britain. Finance Minister Fuad Hussain, during his meeting with Louis Taylor, executive director of the British Export Finance Corporation, discussed Thursday the priorities of the future Iraqi government. "Deputy Prime Minister for Economic Affairs and Minister of Finance Fouad Hussein met in London, Louis Taylor, CEO of the British Export Finance Corporation," his office said in a statement received by Al-Ghad Press. "Hussein thanked the Iraqi government and people for the support they provide to Iraq in financing strategic projects, especially in terms of infrastructure for water and electricity projects," he added. He also reviewed, according to the statement, "the priorities of the future Iraqi government, which came within the government program, which depends on the provision of services and reconstruction and the adoption of long-term strategic projects." For his part, Taylor said that "the Foundation looks forward to future work with Iraqi financial institutions and supporting projects that contribute to diversifying Iraqi sources of income, supporting the private economy and making it a key player in the economy and contributing to the efforts of the Iraqi government for reconstruction and normalization in the affected areas." 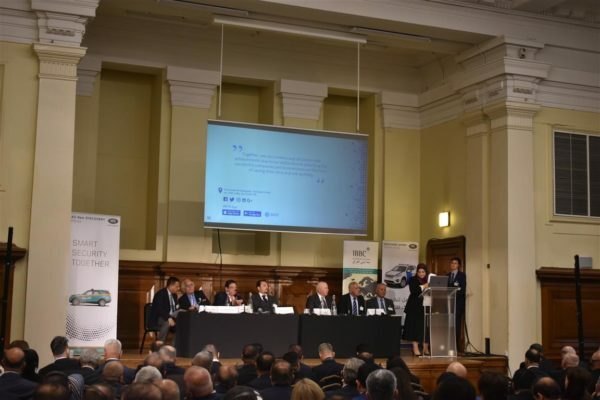 The Iraq Britain Business Council held its Iraq Business Forum on 9th April at the Central Hall Westminster in London on 9th April. The event was led by Eng. Rasmi Al-Jabri Deputy Chairman of IBBC and Richard Cotton, IBBC’s Commercial Adviser. A key note address was given by Dr Salar Ameen, Deputy Chairman of the National Investment Commission. Dr Dara Al Khayat, Deputy Chairman of the Iraqi Federation of Chambers of Commerce and Chairman of the Kurdish Federation of Commerce of Industry headed a delegation alongside many of his colleagues. 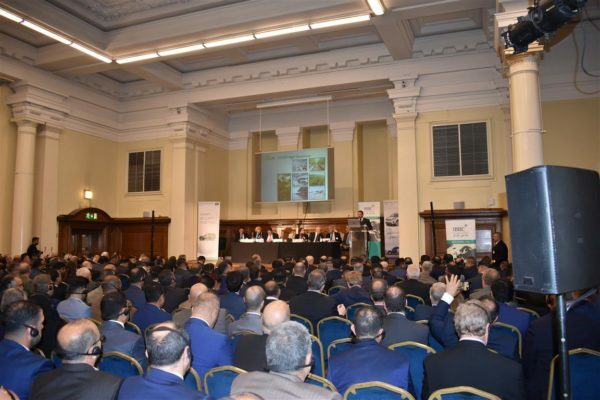 The Forum followed on from last year’s event and this year saw a huge increase in interest from both Iraqi and UK businesses with record numbers of over 350 delegates attending from small and medium sized businesses. 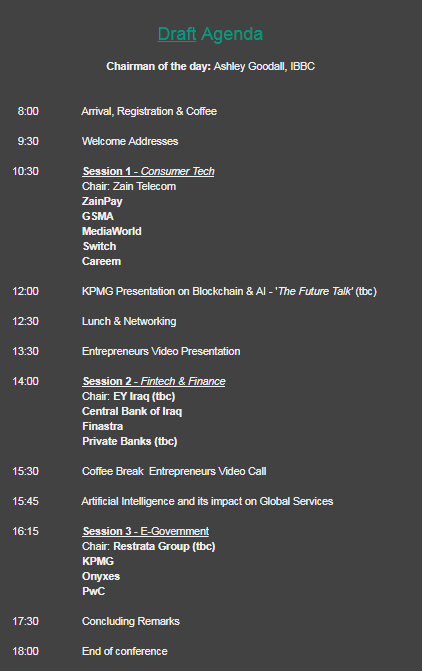 The agenda for the day comprised of a key note speech, two panels of Iraqi and British business people identifying opportunities and capability to supply, followed by one to one meetings between companies hosting displays and our Iraqi visitors. The event was open for all business sectors and covered oil & gas, electricity and water, construction & infrastructure, tech, financial & professional services, healthcare, food processing, automotive and foodstuffs and more. The IBBC is especially grateful to its event sponsor and newest IBBC member, Sadar Trading Group. 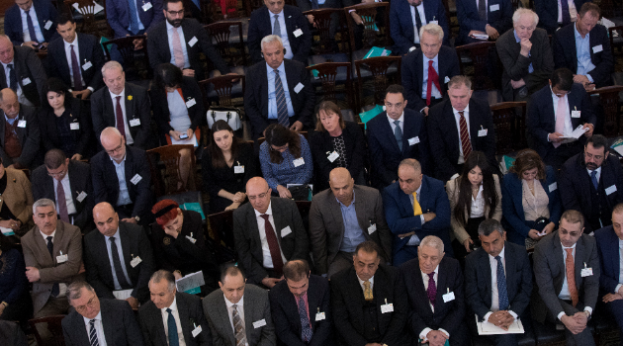 The Iraq Britain Business Council (IBBC) held its annual Spring Conference at the Mansion House in London on 10 April, hosting officials from the UK and Iraqi Governments and delegates from the major companies operating in Iraq covering all sectors of the economy. The conference was entitled ‘Iraq – Financing a Modern Economy’ and was organised in conjunction with the Central Bank of Iraq and the Iraq Private Banks League. H.E. Dr Fuad Hussein, Deputy Prime Minister and Minister of Finance lead a high level delegation of Government officials alongside Dr Mehdi Al Alak, Secretary General of the Council of Ministers, Mr Abbas Imran Mousa, DG Technical Department, Ministry of Transport, Dr Falah Al-Amiri, Councillor for Oil & Gas supplies to the Iraqi Minister of Oil, officials from the Central Bank of Iraq, a delegation from the Union of Private Banks and the Governors of Erbil and Sulamania. 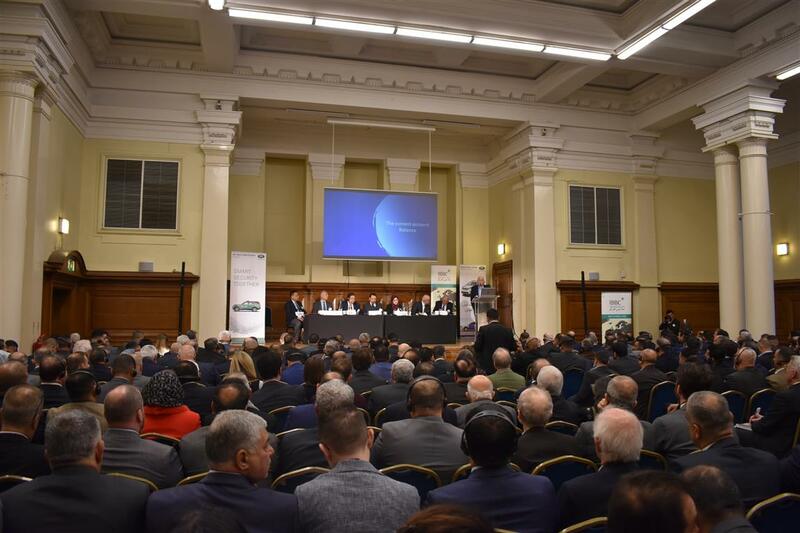 Baroness Nicholson of Winterbourne, President of IBBC and the Prime Minister’s Trade Envoy to Iraq, Azerbaijan, Turkmenistan & Kazakhstan opened the conference alongside Alderman Sir William Russell, H.E. Dr Fuad Hussein, The Rt. Hon. 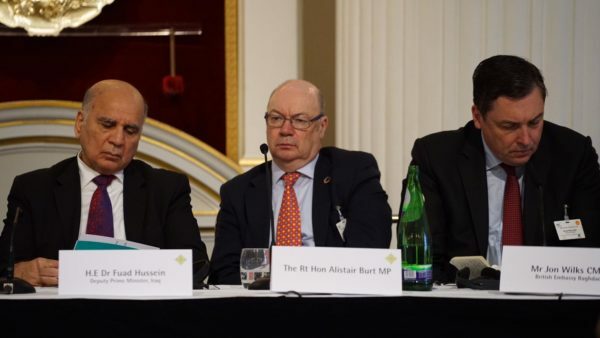 Alistair Burt MP, Graham Stuart MP, Minister for Investment, Department for International Trade and Jon Wilks CMG, Her Majesty’s Ambassador to Iraq. Dr Mehdi Al Alak presented a paper on ‘Private Sector Development and Investment in Iraq‘. Delegates received an exclusive insight into the Government’s planned measures and strategies to realise this ambition. 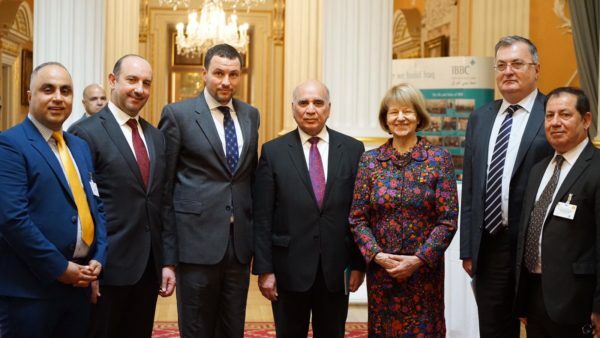 The event marked the 10th anniversary of the Iraq Britain Business Council and special awards were presented to Baroness Nicholson of Winterbourne and Eng. Rasmi Al Jabri, Deputy Chairman of IBBC as a token of gratitude for their contribution to the organisation over the last decade. Dr Renad Mansour of Chatham House, produced a paper on ‘The present situation in Iraq’ which was commissioned especially for the IBBC conference. The IBBC is especially grateful to the sponsors of the event: Shell, the International Islamic Bank, Standard Chartered, Rolls-Royce and Eversheds Sutherland. Fintech (financial technologies) and Iraq’s transition to a cashless society featured prominently in discussions, on stage and off. The second week of April marked two anniversaries, each commemorated for a different reason. April 9 marked 16 years since Baghdad fell and Saddam Hussein’s statue was toppled. April 10 marked 10 years since Britain’s former trade envoy to Iraq, Baroness Emma Nicholson, founded the Iraq Britain Business Council, advancing investment and trade. The air of optimism filling London’s Mansion House, where businessmen and politicians assembled, felt in stark contrast with the public mood in Iraq. Misery hangs heavily over a society in which unemployment rates are sky high and where the value of life is no longer respected. The weight of the fallout caused by the US-led invasion of 2003 is something Iraqis continue to endure. 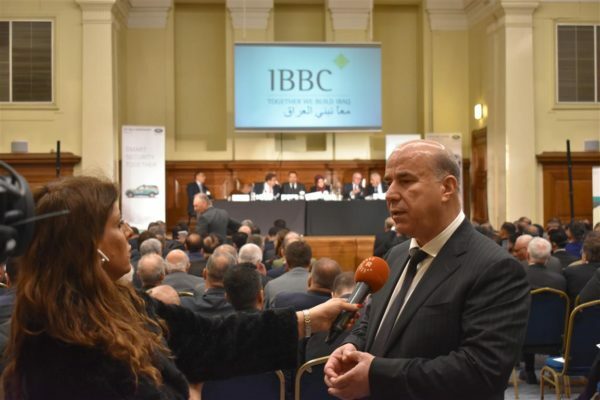 In London, the slogan of the Iraq Britain Business Council (IBBC) — “Together We Build Iraq” — greeted guests at the venue. 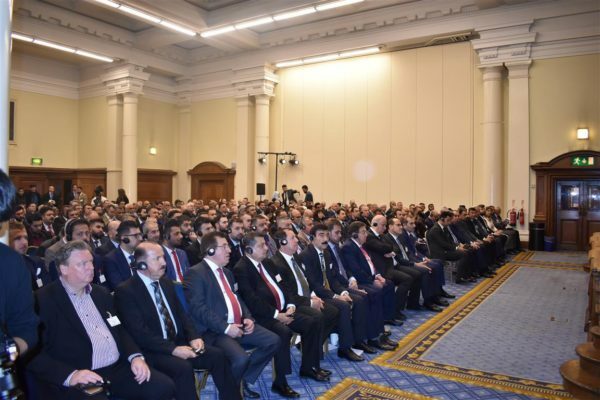 British businesses were in strong attendance alongside Iraqi delegates led by Deputy Prime Minister and Finance Minister Fuad Hussein. 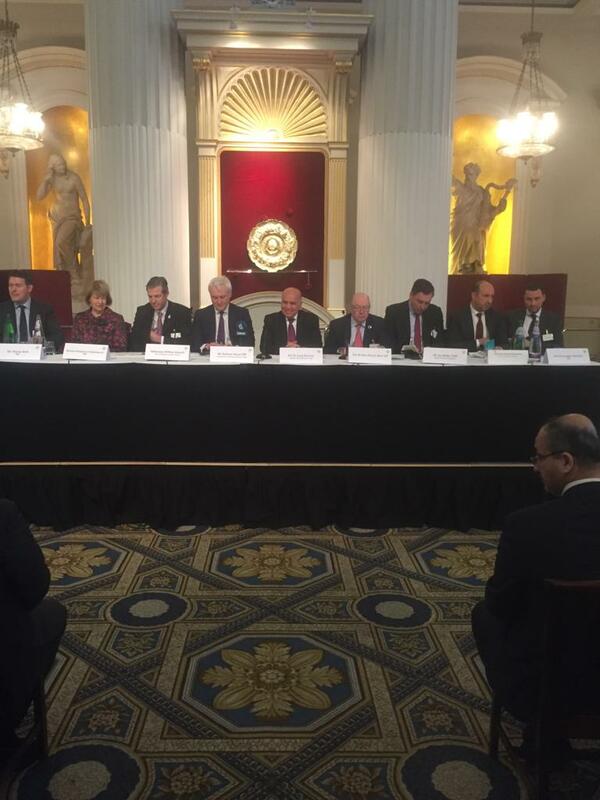 There were representatives from the Iraqi Private Banks League, the Central Bank and more. 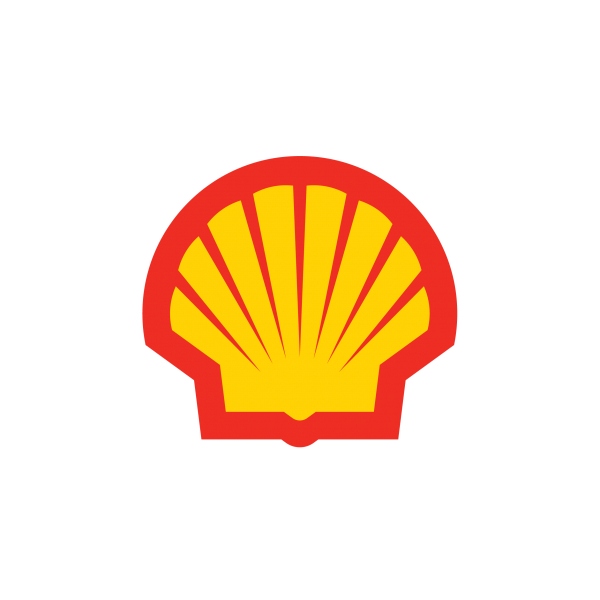 The event drew major foreign players and sponsors from BP-Iraq and JP Morgan to oil giant Shell. The conference set its sights on modernising Iraq’s economy. The aim, in the words of Iraqi Council of Ministers Secretary-General Mahdi al-Alak, was “to target the lifeblood of the economy” through sectors such as oil, energy, infrastructure and education. Alak emphasised the necessity of “coming down hard on corruption” before Iraq can turn its back on paper-operating procedures. Fintech (financial technologies) and Iraq’s transition to a cashless society featured prominently in discussions, on stage and off. The success of fintech, however, depends heavily on the behaviour of the ruling political class. Corruption has consistently stood in the way of effective governance and trade but those are barriers that speakers promised would be resolved to the benefit of both Britain and Iraq. The drive towards economic diversification was another promise that rests on the state’s commitment to fighting corruption so state revenues can be more evenly distributed beyond the oil and gas sector. Although politics was strictly off the agenda, speakers commended Iraq’s security forces for defeating the Islamic State last October. Endemic corruption, lawless militias, soaring birth deformities, abnormal cancer rates and dilapidated services, all major problems in the country, were nowhere to be seen on the agenda. The economic consequences of conflict, which existing and preceding governments in Iraq have inherited, have proven profoundly challenging. The problem is exacerbated by corruption, which stunts domestic growth. Iraq’s economic freedoms and the collapse of many of its productive state-owned enterprises, due to American-style reforms, have eroded many of the rights formerly enjoyed by local Iraqi businesses. Trade barriers in place that had protected them no longer exist. Hussein praised the equal presence of Iraqis and Brits, barely mentioning the uneven relationship between his country and the United Kingdom. It is of critical importance to note that no regulatory framework determining trade rules, co-investments or healthy competition exists. As wealthy British Iraqis are presented with invaluable opportunities to invest in their ancestral lands, at such events, one cannot erase from recent history the memory of the suffering of native businessmen and women in farming, psycho-social care or copper production — many of whom are unsupported by the state. The head of one Iraq’s private banks said a rapid expansion of private banks, which he said stands at 74, has done little to strengthen the dinar or enhance domestic banking performances, compared with global standards. “It just means that more people want a share of the pie,” said the owner of the Iraqi private bank, who did not wish to be identified. “The sale and auction of the US dollar is another major problem,” the banker added, referring to a practice that Iraq uses to exchange the dollars Iraq receives in oil income to dinars through private banks. The practice is particularly harmful because it lacks transparency and invites unvetted actors. It has facilitated money laundering and weakened exchange rates. Still, the auctioning of the dollar is something the central bank has dogmatically defended. The Iraqi street, whose concerns have been loudly voiced and whose anger has been seething for some time, was strategically kept out of the debate. 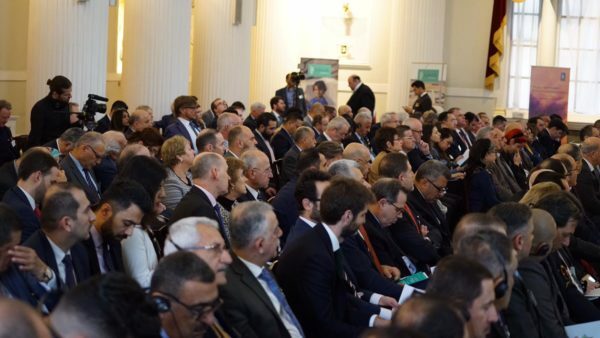 The course of the day fell in line with similar conferences, from Kuwait to Iraq, during which host countries proudly brag about the investment funds they wholeheartedly believe will help Iraq to fulfil its role in the global economy. However promising the idea brought to IBBC’s roundtable this year, the question on the minds of concerned citizens is whether Iraq’s allies, international partners and friends will continue to turn a blind eye to the single greatest obstacle to economic prosperity and trade — corruption. Nazli Tarzi is an independent journalist, whose writings and films focus on Iraq’s ancient history and contemporary political scene. Prime Minister Adel Abdul Mahdi, the Iraqi government focused on the development of economy, trade and investment, saying that the stability of Iraq gives a greater chance to benefit from the British experience. "The Prime Minister received his official office and the British Minister of State for International Trade, Liam Fox," Abdul Mahdi's office said in a statement received by Al-Iktissad News. "The Iraqi government is focused on developing the economy, trade, investment and other vital sectors after achieving victory, opening streets and roads and lifting the barriers that revealed a new face to the capital Baghdad," he said. He pointed out that "the stability of Iraq gives greater opportunity to benefit from the British experience in the development of the Iraqi economy and small and medium enterprises and the agricultural sector, which is witnessing the doubling of agricultural production because of the abundance of water." For his part, the British minister expressed his satisfaction with the "Iraq witnessed the stability of security and social touch during his visit to Iraq in a clear and large," reiterating the desire of the British government to "strengthen relations with Iraq and increase investments further, and provide expertise in financial and legal and job creation. The British ambassador to Iraq, John Wilkes, attributed the deterioration of the Iraqi economy to several factors, notably corruption, bureaucracy and investment laws. "Iraq, with all the potentials of natural and human resources, the business environment according to international standards is better in Afghanistan compared to Iraq and even Nigeria with all its challenges and problems," Wilkes said in a video posted by the embassy on its Facebook page today. Benefit from each barrel of oil more than three and a half times more than Iraq means more economic value of national wealth. " "This is unacceptable to all Iraqis and all friends of Iraq, including the United Kingdom, and we want to help Iraq introduce the necessary reforms and implement the projects now." "To clarify to the Iraqi people, the partnership between Iraq and its key partners in the economy, in business, trade and investment leads to tangible positive results on the ground," Wilkes said. President Barham Saleh praised the British support for Iraq in its war against terrorism, stressing the strengthening of bilateral relations and exploitation of investment opportunities. "President Barham Saleh received at the Peace Palace in Baghdad the British Minister of State for International Trade Liam Fox and his accompanying delegation. The meeting reviewed the relations between Iraq and Britain, especially in the commercial and economic fields, The two countries and realize the aspirations of the two friendly peoples. " He praised the British support for Iraq in its war on terrorism, stressing the strengthening of bilateral relations and exploitation of investment opportunities and that international companies contribute to the reconstruction of liberated cities. In turn, the British minister renewed his country's support for Iraq in various fields, indicating the United Kingdom's efforts to promote economic and trade cooperation between the two countries. [ltr]A statement issued by his office received the news agency "Euphrates News" that Hussein "met in Baghdad, Liam Fox, Secretary of State for International Trade British, and during the meeting exchanged views on mechanisms to strengthen trade and economic relations between Iraq and Britain. Fox expressed "the desire of British companies to come and work in Iraq and benefit from investment opportunities in various sectors, especially in the development of the banking sector." For his part, welcomed the Deputy Prime Minister for Economic Affairs, "all investors and companies wishing to enter the Iraqi labor market, and that Iraq needs British expertise in the development of banking, especially Rafidain and Rashid and real partnerships to improve the level of services provided to citizens." The two sides agreed on "the need to create an attractive and safe working environment to encourage investment and investors." Prime Minister Adil Abd Al-Mahdi received in Baghdad on Monday the UK’s Secretary of State for International Trade, Dr. Liam Fox. Prime Minister Abd Al-Mahdi thanked Dr. Fox for the UK’s continuing support for Iraq and reiterated that the Iraqi government is focused on promoting economic development and delivering tangible improvements to services and critical infrastructure. The Prime Minster added that Iraq values British expertise across a range of vital economic sectors, and welcomes the participation of UK companies and businesses in the reconstruction of Iraq. The UK International Trade Secretary reaffirmed his government’s commitment to supporting Iraq, and announced that the UK is making available an additional £1 billion to support UK exports to Iraq, bringing the total to £2 billion. During his visit to Iraq, the UK International Trade Secretary will also meet other senior officials, speak to young Iraqi entrepreneurs, and meet British firms working in the country. announced that the Government of the United Kingdom Wednesday, the results finally to visit the economic delegation to Iraq, which took place earlier this week. 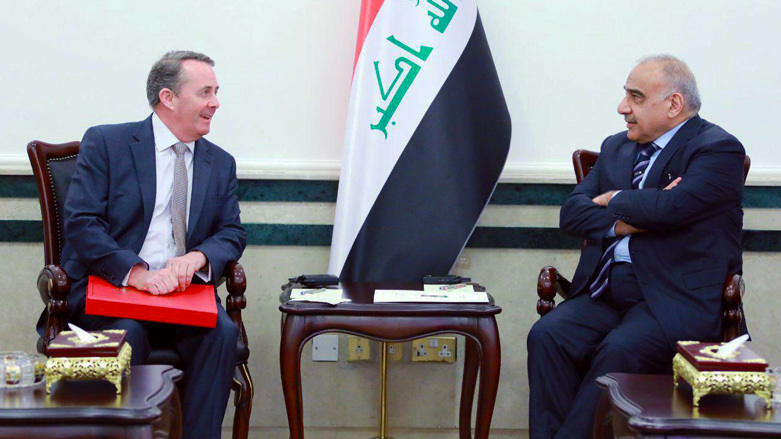 The delegation, led by International Trade Minister Liam Fox, has agreed to "provide greater support to British companies operating in Iraq, which will in turn provide jobs and greater stability in the region," the British government said in a statement. "The British government announced an increase of one billion euros, in its commercial dealings with Iraq," stressing that "the goal is to build the Iraqi state and achieve economic growth." It is noteworthy that an economic delegation headed by Liam, arrived in the capital Baghdad last Sunday, in order to meet with Iraqi economic entities, and to make progress in economic relations between the two countries. 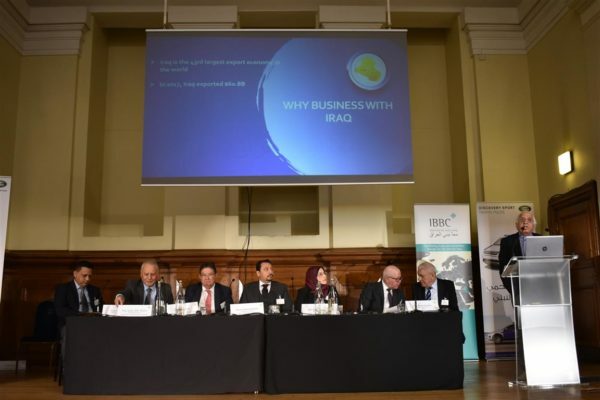 The delegation of the Baghdad Chamber of Commerce participated in the Business Forum of the Arab-British Chamber held in London, where the delegation included the Board of Directors of the Chamber, the Chambers and more than 60 women, businessmen and traders. The head of the Baghdad Chamber of Commerce Jaafar al-Hamdani said during his speech during the forum that "investment opportunities available in the fields of industry and agriculture are attractive elements of the Iraqi labor market and British companies can enter the Iraqi market and investment in more than a production and service complex." Al-Hamdani pointed out that "the investment law gives a lot of facilities to the investing companies and that the security situation is stable and Iraq is ready to attract companies wishing to invest." The delegation also met with the charge d'affaires of the Iraqi Embassy in London. 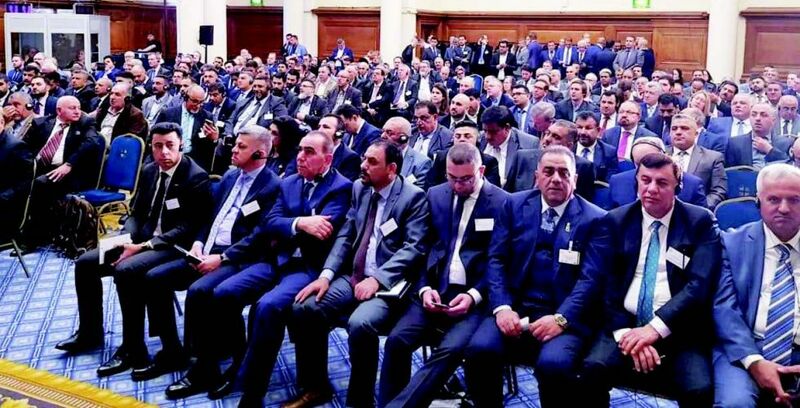 The event coincided with the launch of the conference of the Iraqi-British Businessmen Center (IBBC) with Iraqi participation through Iraqi companies and businessmen. The conference was attended by the Chamber's delegation and members of the National and Joint Chambers of Commerce and businessmen. For his part, the Chairman of the Iraqi Business Council - Alaa Al-Nouri, said "a group of side meetings held on the sidelines of the conference delegations involved in various economic fields, and also met with a delegation of representatives of British companies"
The Iraqi-British Business Council is a strong network of some of the most important international companies as well as the main Iraqi and British chambers of commerce and chambers. The Council enjoys the highest level of support from governments and the European Union. 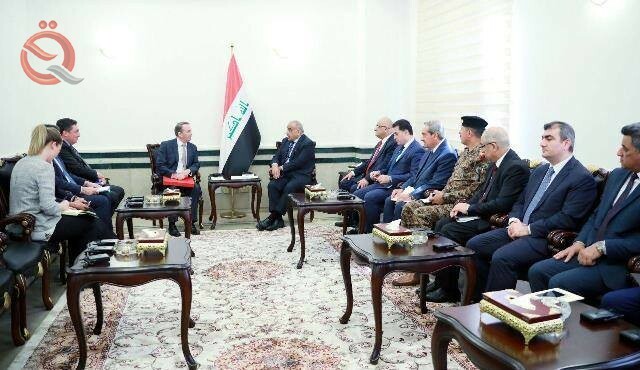 The Nouri said that "the delegation provided detailed explanations on investment projects and trade in the province of Baghdad and the possibility of the Council to provide full support to British companies and businessmen wishing to implement strategic and investment projects in Iraq." 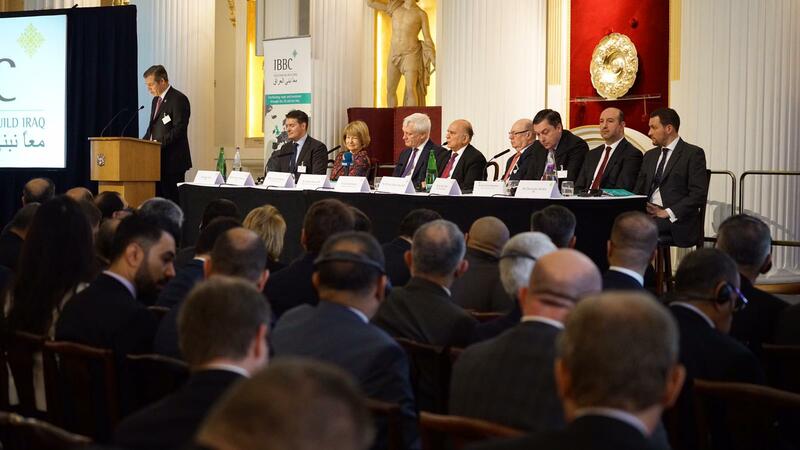 Building on the commitment to make Iraq a thriving country, the British Iraqi Business Council (IBBC) has established very strong relationships to benefit the business, industry and citizens of Iraq. The NIA also provides full support to the Iraqi-British Business Council (IBBC) to achieve its objectives. The council is seeking stronger business partnerships than ever between companies operating in Iraq and Britain and organizations that benefit each and help in particular to improve the business and educational environment for the development of the country. The Council also facilitates and promotes international trade and investment throughout the UK and Iraq, and acts as a catalyst for private sector growth through the transfer of deep knowledge and the development of education and training infrastructure in the country. The IBBC (Iraq Britain Business Council) is launching a Tech Conference in Baghdad on 29th and 30th April. The Conference is showcasing leading Iraqi and International companies with the intention of building confidence for Tech initiatives within Iraq. Iraq is at a pivotal point in its development as it revives and rebuilds its infrastructure, so now is an ideal time to review the opportunity that modernisation and tech could bring to the country. IBBC is keen to support modernisation and its benefits, and to share what we have learned in the UK. With political leadership, a positive investment climate and the talent and interest among young people and the right educational skills, tech can take off in Iraq, in the way it has in the UK. The conference aims to showcase the best tech companies in Iraq, to give confidence and support to those on the way up and to change perceptions about the country and encourage investment. Leading Iraqi companies include: Almaseer Insurance, Inspire Solutions, Zain Telecom, Careem, Switch, Media World, Zain Pay, National Bank of Iraq, KRG, Onyxes, Re:coded, Five One Labs, Khudairi Group, Iraq Tech ventures, Arabnet, Central Bank of Iraq and many international groups such as BP, PWC, EY Iraq, KPMG, Finastra and many more. The Governor of Central Bank of Iraq kindly confirmed his attendance. IBBC want to provide a platform and focus for Tech in Iraq and give inspiration and confidence to those building a modern Iraq. Come and join the new wave and help modernise Iraq. The IBBC Tech Conference is taking place in Baghdad, the Babylon Hotel on 30th April with an Entrepreneurs event on 29th April. IBBC will be holding an Evening Reception for Entrepreneurs and Start-Ups at ‘The Station’ in Baghdad the evening prior to our Tech Conference on 29 April. 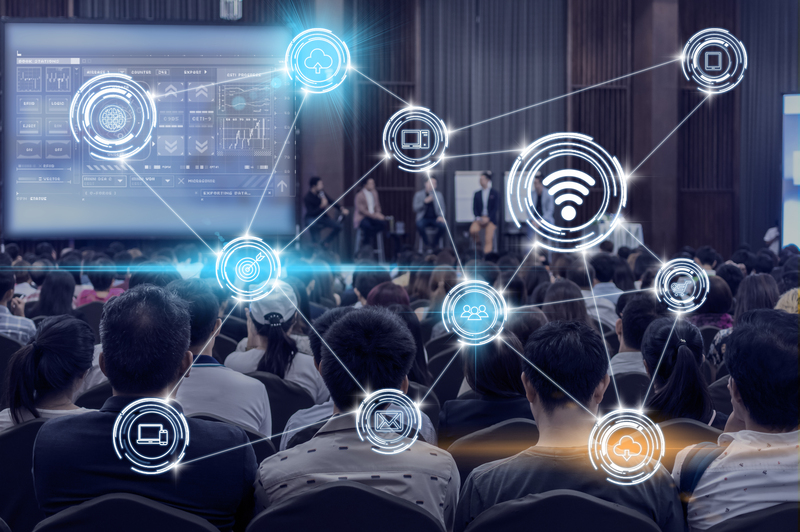 This exciting event will showcase the growing tech community in the country and give an outstanding platform for some of the leading start-ups and entrepreneurs in a more informal setting. IBBC is bringing together the leading companies involved in Tech in Iraq to discuss the various strands of Tech and the evident possibilities for investment and engagement in Iraq. This is the first Tech Conference in Iraq and its purpose is to drive confidence, investment and awareness of the power of the new tech economy and how it can benefit Iraq. Technological applications can enable Iraq to become more productive and efficient and a driver for transparency, a mechanism for government payments, a means to interact with its citizens and a source of new employment opportunities for young people. IBBC and its members are fully supporting the event, which will attract and convene private industry, entrepreneurs, investors, government minister, young practitioners, international business and media. You, your clients and associates are all invited to contribute to this Tech Event. Please register, for free, [email=london@webuildiraq.org?subject=Registration%20for%20IBBC%20Tech%20Conference&body=Hi%2C%20please%20send%20me%20the%20registration%20form%20for%20the%20upcoming%20IBBC%20Tech%20conference%20on%20the%2025%20November.%20]here[/email]. 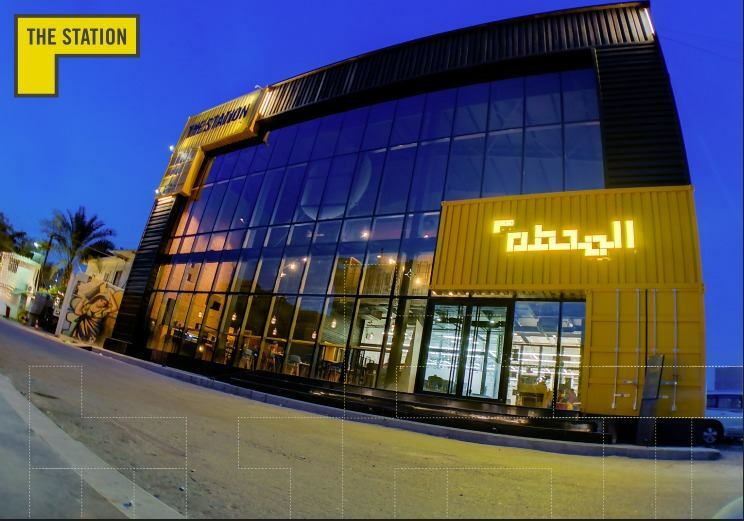 IBBC will also be holding an Evening Reception for Entrepreneurs and Start-Ups at ‘The Station’ in Baghdad the evening prior to the Conference on 29 April. To showcase the growing tech community in the country and to give a platform for some of the leading start-ups and entrepreneurs in a more informal setting.